I can hardly tell you how much we've been enjoying This Country of Ours by H.E. Marshall. This is our second time through the book. The first time I read it aloud to our older ones. This time I get to be a listener, too! We're listening to Alcazar Audioworks' version of this book on CD. I like the fact that we can be folding laundry or washing dishes while doing our history reading! The CD is divided into tracks, making it easy to break up the reading and have the listeners tell back (or narrate) what they've heard. H.E. Marshall, the author of This Country of Ours and other history books for young people, was a gifted storyteller with a passion for her subject. Her writing, though full of historical events, dates, and facts, is never dull or dry, being a series of stories about individuals and the events they shaped or found themselves caught up in. Alcazar AudioWorks has undertaken to make this book available on CD, unabridged, but divided into eight parts. This makes it easier to buy just the chapters I need for our current history studies, which helps our homeschool budget. To get an idea of the book, look for it online as a free e-text. 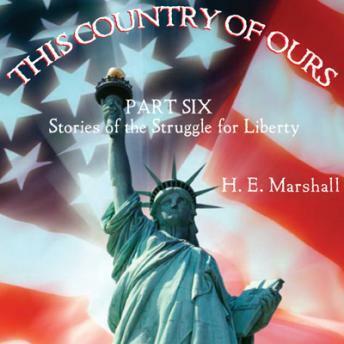 Part Six: Stories of the Struggle for Liberty is comprised of chapters 51 to 63 in the book. Here are the stories of the American Revolution that you heard when you were younger - or maybe you didn't! To give you an example from my own experience, I can't remember hearing so many details about the names I memorized in school. So far as I was concerned, Benedict Arnold was a byword for treason. I didn't know that he was a dashing, heroic figure, regarded by George Washington as one of his best officers. Here are stories of Washington himself, of Paul Revere's ride, the Boston Tea Party, Patrick Henry's famous speech, the Declaration of Independence, the winter at Valley Forge, of a woman who fought alongside her husband and kept fighting after he fell in battle, and more. He was a stout young man with a lovely smile and jolly fat laugh, who greatly enjoyed a joke. He had been a bookseller before the war turned him into a soldier. And now as he felled trees, and made sledges, and encouraged his men over the long rough way he hugely enjoyed the joke of bringing British guns to bombard the British out of Boston. One more note of caution: As This Country of Ours was published in 1917, it does not meet today's standards of political correctness. For example, the account of the Boston Tea Party describes how the men dressed up like ""Red Indians."" This Country of Ours is one of the books used in the Ambleside Online curriculum. The sets correspond to the divisions within the book, rather than Ambleside Online years. However, it is not difficult to figure out which set(s) is needed if you compare the chapter listings on Alcazar's and Ambleside's websites. Whether or not you are using Ambleside Online's reading list, you'll find This Country of Ours a fascinating look at American History, livelier than anything you'll find in a textbook. Highly recommended.